“As of all foods, bread is the most essential, so the thought of death is the most necessary of all works. The remembrance of death amongst those in the midst of society gives birth to distress and meditation, and even more, to despondency. But amongst those who are free from noise, it produces the putting aside of cares and constant prayer and guarding of the mind. But these same virtues both produce the remembrance of death, and are also produced by it” (Saint John Climacus, The Ladder of Divine Ascent, Step 6, sec. 4). Autumn 2015 marks the end of a summer which began with the sudden passing of a close relative and even closer friend, to whom I will refer hereafter as B. Since the passing of B, the calendar after and until the one-year anniversary of the accident has become one of those holiday firsts that arrive with an unfair expectation to yield to celebration in the midst of bereavement. The commitment to commune minus one is stubborn, but for those who love B, these occasions are stinging reminders of the now-gnawing hunger that starves the soul. What is more, here I write in a season when the appreciation of new colors on the botanic palette inspires momento mori even in our own death-averse culture. Arriving at this season, and seeing also the Halloween ephemera, I think about Tom without B, and life hereafter in my uncomfortable state that is the amalgam of grief—an ever-complicated theology, and the influence of the zeitgeist that, when entertaining the idea of bringing the dead to life, intends a macabre reanimation rather than cosmic restoration. This is the season of ghouls and ghosts in light-up sneakers, and so I wonder: If the language of resurrection were left to a society so fearful of her dead, how would B or anyone be received if born suddenly from their grave? For I would imagine in that moment, if not for God’s redemptive work, B would just as soon see his family blench and run than to be pulled into us in reunion. So now it is in the wake of immense loss that I make a new appraisal of the season of the dead and dying as received here in the West. That is, without becoming bogged down in the history of Hallowtide and its conflicts with the Halloween culture, I intend here a macro-look at my own death theology and explore its language. This exploration will be attempted via a brief account of my observations of grief, followed by an appeal to opportunity, to honor B in his own season as a requiem. That his fellow dead in Christ speak from the throne of Revelation, which in the Christian mind’s eye looms above a passing world order, is enough to make on me an unrelenting demand that B in his present state is seated in a greater weight of meaning than what is given in a culture that finds entertainment in its fear of the unknown. 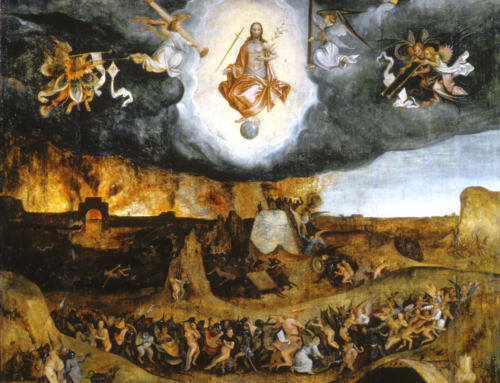 The biblical account before the climactic Christ event makes death an invariably quiet exit. Samuel’s departure from this life is but a footnote in the story of Saul, and Saul’s but a barrier removed for the rise of David. Regarding the latter, the reel of David’s life cuts from warring king to an infirm, old man, and so hero after hero are made low and placed along the plane of the readers’ own, less exciting, life stories. Then, though I admit it is a gross leap of time within the narrative, there occurs the Passion of the Christ and resurrection. If we string the death of heroes into its own narrative, the resurrection of the Christ breaks more than historical convention. The divine breath returns to the holy corpse to reveal that the mind of God has in purview a vast reconciliatory landscape far exceeding the then-national expectations of Second Temple Judaism. The Kingdom of God had laid claim to all powers this-worldly, other-worldly, and under-worldly. So B, a Christian brought into the fold, followed his Lord into the tomb with the same air of quiet submission, which, in a world of “anti-aging” oils and remedy, communicates a powerful act of witness regarding his place on the plane of linear history. Right now, as in the words of the Old Testament historian, B sleeps with his ancestors. But it must be said here, the beauty of the resurrection scene does not make death less ugly. In fact, reading the two accounts back-to-back—that is, of the Passion and of resurrection—provides us an important juxtaposition made by the Gospel writers that silences the jeering crowds with a timorous gasp at the mouth of the empty tomb. As we do not understand what is night without what is day, so we cannot know any extreme without its contrast. There is, therefore, a defining contrast for resurrection provided to us in the big picture: Hurt defines hope. The question, “Son of man, shall these bones live?” first spurred a shrug of the prophetic shoulder, and now at this question comes forth univocal affirmation that because the Christ lives, so the Christian dies with requited expectation. For Tom without B, however, this defining hurt at times overwhelms anticipation. I watched his wife and mother beside the box. I heard his wife and mother beside the box, and I recalled the grief of Achilles’ mother Thetis whose voice roused the goddesses of the sea. Captured in the myth is a primal summons that reaches the divine ear at the moment a mother’s resolve breaks and demands explanation. For those of us who hear the challenge and not its answer, for even the Christian, these episodes make resurrection again seem impossible. Impossible that is until we behold the tragic miracle of a mother living beyond her moment of loss. To this present miracle I say, may we reflect upon the Mater Dolorosa on her worst day and marvel at the power that keeps mothers from nailing their wrists to the crosses of their children. When comparing this power to remain to that which restores the dead child, if indeed they are not the same, I wonder which is more impossible. The smile of B’s mother, when it comes, pivots the world. Where she stands marks the X of Parousia. As I explore my own grief, I ask that other Christian minds explore also in this season, to rebuild a robust death theology and to speak in a new way that inspires the imagination, as the rest of society takes time to talk about death. After all, who better to teach the world about what it means to be the living dead than the Christian? For it is in the Body of Christ, beaten but unbroken, that the living faith of the dead remains and reminds us that the voice of the weeping mother has burst through the floor of heaven to bring us theophany and eventual reconciliation. So it is in this month and in its season that there is opportunity for the Christian, in the midst of dancing skeletons and zombie masks, to introduce requiem and lament, at a time when the occult captivates the secular and when the language of death and dying is limited to the corporeal. I ask that the opportunity inspire creative responses and theology-rich discussions that bring some perspective to a shared fate, and that B and the deceased are provided the necessary space to speak for themselves before we join them in our time. May the Lord remember them, bless them, and keep them.